Brave Ukrainian pilot, MP Nadiya Savchenko, was kidnapped in Ukraine, illegally transported to Russia and unjustly imprisoned there. She has been on a hunger strike since Dec. 13, 2014, protesting her unlawful imprisonment by Russian authorities, based on bogus charges. Putin’s lawless regime refused to release Nadiya (in spite of her international diplomatic immunity), as well as numerous other Ukrainian POW’s languishing in Russian prisons. Savchenko is imprisoned in the same jail where Sergei Magnitsky was brutally murdered. Nadiya’s big heart and unbreakable spirit has made her a symbol of Ukraine’s strength and independence. Even as her life hangs in the balance, this fearless young woman is determined to continue her hunger strike – until her release, or until her death. “A person who was born free and not a slave in captivity cannot live in prison, especially if he or she is innocent,” Savchenko wrote in a Jan. 12 open letter. “I have given my word: ‘Until the day I return to Ukraine, or until the last day of my life in Russia!’ and I will not back down.” In a video of her interrogation, Nadiya said that she does not expect to return home alive, but is not afraid. She said that her strength comes from her faith in God, as well as the energy of every person who thinks of her at least once a day. Countless people are, in fact, thinking about Nadiya all over the world. One of these people, an Englishman Alex King, felt compelled to help free Savchenko and bring worldwide attention to her cause. King is not Ukrainian and has no connection with Ukraine, but his plight to help Nadiya made him feel as part of a huge family, none of whom he’d ever met before. As he was writing a book about the Zulu War of 1879, King found himself enthralled with more recent events. News coverage of Ukraine’s Maidan revolution, followed by Russia’s forcible annexation of Crimea, fascinated the inquisitive writer to the point that he became distracted from his book. Frustrated, King cancelled his Internet service to avoid interruptions. Still, he couldn’t stay away from the news for too long. Eventually, King went back to reading about current events in Ukraine. He grew increasingly irritated by the quantity and material misrepresentations in Kremlin-sponsored trolling that accompanied most articles about Russia-funded conflict. From that point on, he was on a mission to help Ukraine fight against Russian propaganda. After several successful Twitter campaigns, on Nov. 19, 2014, King decided to do something meaningful for Nadiya Savchenko. As @GlasnostGone on Twitter, he created #FreeSavchenko hashtag and reached out to Savchenko’s attorney, Mark Feygin. King created images and videos to get the word out, with support from Euromaidan PR, Euromaidan Press, as well as diplomatic missions of Ukraine in the U.S. and Canada. The campaign went global, garnering over 425,000 Tweets and Facebook postings. 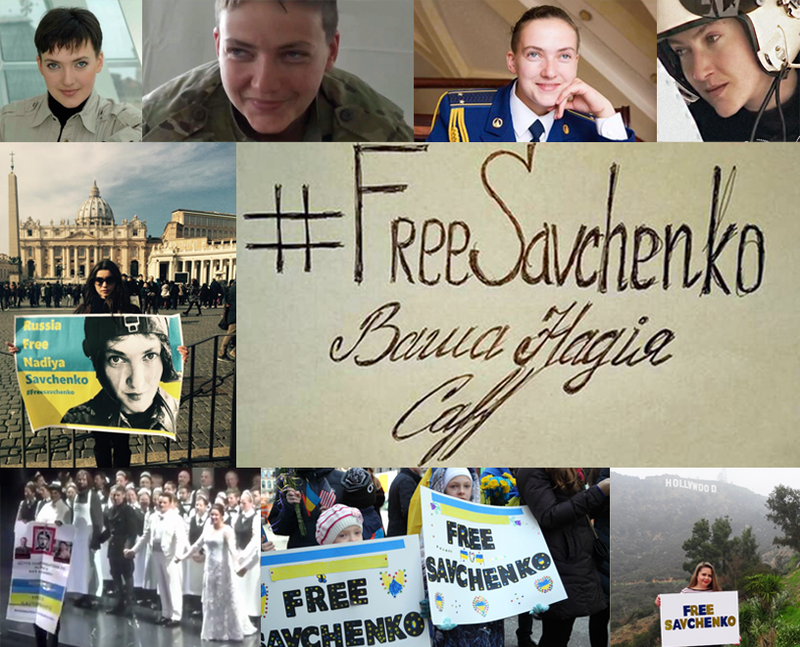 #FreeSavchenko united people all over the world in their support for Nadiya – the woman strong enough to stand up to Putin’s corrupt regime. It also brought additional public awareness about Russia’s unlawful activities in Ukraine. Nadiya Savchenko is clearly one of Ukraine’s heroes. Her name and her plight will never be forgotten. While Putin sees himself as invincible and those who oppose him as expendable, in reality it’s the other way around. All over the world, people are awakened by the cowardly deception of the Russian media. They’re appalled by the Kremlin’s ruthless brutality against Ukraine and its brave defenders, including Nadiya. No matter what happens next, history’s scoreboard will forever reflect: Savchenko – 1, Putin – 0.